Check out our growing selection of micro-brews and wines during your next trip to the Haverhill Beef Co.! Welcome to the Haverhill Beef Co. web site. Located in the heart of downtown Haverhill, Massachusetts, the Haverhill Beef Co. is a full service, old-fashioned butcher shop and meat market that continues to be a valued family tradition since 1952. Haverhill Beef Co.'s reputation was built on selling only the best quality watch and we will not compromise your trust for a lower cost-value quality product. Our beef is USDA Chairman's Reserve Certified Premium. Cut fresh the way you want it then trimmed to perfection. We bring in fresh USDA certified poultry daily to ensure you get the freshest products available. All our marinated steak tips are made in our store. Our certified premium, heavy western pork is selected for size and tenderness and trimmed to perfection; you're guaranteed the best-tasting, most tender pork available. Steaks and roasts are cut many times daily. Our hamburg is ground in small batches as needed daily for guaranteed freshness. Cut to order always available. 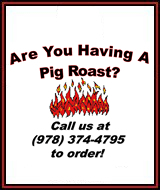 Haverhill Beef Co.'s meat packages are made from the fresh, high quality meats you would buy from our display cases. Never put up and frozen; always packed when ordered. Click HERE For Map To Store!